HS's post below on the implications of a war with Iran is stimulating a lively discussion about the role oil will play in our future. I started to write a response in that thread -- but then realized that this needed its own post. For the record: I did my very first futures research project on the future of Canadian oil. And Mr. R is a third-generation oil guy, so this is a subject that's near and dear to our hearts (and also to the hearts of our bankers, assuming they have any). Based on all that, here's my understanding of where America currently stands on the oil front -- and why we're headed where we're headed in the years ahead. The US's number one source of oil is Canada, which sends about 1700 thousand bbl/mo, much of it through pipelines that cross the prairies and dump the stuff right into the American heartland. A couple decades ago, the US signed contracts that ties up a huge chunk of Canada's annual production: the net effect is that the US gets about 85% of Canada's production. Anything above and beyond that, Canada is free to sell to other buyers. And given the growing instability in the US, it's actively looking to cultivate other relationships. Right now, they're building a port north of Vancouver that will be a pipeline terminal servicing tankers bound for China. Canada's conventional stores have been on the downward side of Hubbert's curve for the past 15 years or so; but that's being more than made up for by the ramp-up of oil from the tar sands in northern Alberta and BC, and into the Yukon. Getting oil from shale is dirty, expensive business -- it's not even profitable to try unless oil's trading over $40/bbl. The process also utterly destroys the boreal forests -- one of the planet's largest carbon sinks, and thus one of our main bulwarks against global warming. So far, they don't know how to restore them (though biologists are trying, and rumor has it they're getting better at it each year). Until they get that right, Canada's oil extraction industry may well be the single largest source of human-caused environmental destruction on the planet. Nobody outside of Alberta and BC is happy about this state of affairs; the country faces a stark choice -- money or the environment, pick only one -- that may well lead to a serious political split in the coming decade. Some reliable sources say that Canada's oil shale deposits are the second-largest remaining oil resource on the planet. (Other reliable sources say Number Two is Iraq, which has never been developed properly due to decades of instability there. See now why the oil companies were so hot to go there?) Both are still on the sunny side of Hubbert's curve, which means there's a lot of profit to be made for a long time to come. The Saudi regime has been stable for a stunningly long time; but the country is now top-heavy with princes, and keeping them in Rolexes and Rolls-Royces is seriously impoverishing the rest of the country. Some observers are very concerned that the growing wealth gap is making the House of Saud a very unstable ally over anything but the shortest term. And their fields are now 40-50 years old, with production visibly declining. Their own figures claim that they've still got the largest remaining reserve in the world; but there's a consensus among analysts that these figures are cooked, and the actual picture is nowhere near as rosy. Unfortunately, nobody has the first clue about what the true figures might be. Fourth on the list is Venezuela, which sends about 1100 thousand bbl/mo. Personally, I think Hugo Chavez is a pretty interesting guy (but then, I don't think Fidel Castro is a demon, either). He seems to have done right by his people, using far more of the oil money than most other countries do for things like education, health care, infrastructure, and other public goods. (Yes, there's corruption; but wherever you have oil, you have corruption. Chavez's government has avoided this admirably well compared to most oil states.) And he's willing to use the power of oil to play hardball with the US, which is why our powerbrokers hate him. Their fields are still producing strongly, and it will be a while before Hubbert's curse really kicks in for them. After that comes Nigeria (disclosure: I have a close cousin who's serving the empire as a field engineer building oil infrastructure for Chevron there) at about 900 thousand bbl/mo (give or take). Then, all the small suppliers: Iraq and Angola (about 500 each); Colombia, Kuwait, Libya, the UK, Ecuador, and Brazil (100-200 each). Even so: All of that is dwarfed by our own production. The US produces about 150,000 bbl/month from its own domestic sources, more than all the rest combined. This energy is THE source of our power in the world. Some of this is still coming out of ancient fields in Texas, Pennsylvania, and California, which are well down the curve but still producing at least some. More is coming from Prudhoe Bay -- but this, too, is now tapering off. The Great New Hope lies in fields (conventional, gas, and oil shale) being developed in Colorado and Wyoming -- fields that promise to devastate vast stretches of the remaining American West, and for which the American taxpayer receives far less than the going royalty rate. Resistance is fierce, and growing. That's where we are now. In every case, Hubbert's Curve is the devil in the details. The US is still a world production powerhouse; but those fields are anywhere from 30 to 80 years old, and almost all of them are well on the downward side of the production curve. We cannot expect to sustain that for more than a decade or two at best. Canada, as we've seen, has plenty to spare; but the environmental costs may prove to be disastrous in the face of climate change. Mexico's on the downhill side, but not too far yet. Venezuela's about a decade behind them. The Saudis are their own story. And after that, all we've got are troubled little countries that have been turned into war zones for having been blessed with black gold. At some point, you have to ask how many mercenaries you're willing to hire, how many locals you're willing to kill, how much trouble you're willing to go to before it's no longer worth pulling out the few million barrels a month you're going to get. Between them, they are mere drops in the world bucket -- but the thirstier we get, the more those drops matter. Though, soon enough, we may not even have access to that option. Most of these small producers are in Africa and South America. Over the past few years, China has been actively courting their governments, building roads and hospitals and infrastructure in exchange for exclusive contracts on their oil. (Once upon a time, America used to get its oil by being the Good Guys, too -- before the oil companies decided using taxpayer-funded soldiers to just take the damned stuff was better for their bottom line. Whenever possible: socialize costs, privatize profit.) As a result of this -- and our own wretchedly bad behavior in Iraq and elsewhere -- they are rapidly co-opting the Good Empire reputation America once had in these parts of the world. 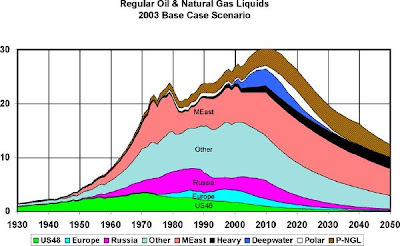 The upshot is that worldwide oil consumption is going up (driven hard by the industrialization of China and India); and, apart from Russia, nobody knows where the oil will come from after the next decade or so. You look at all this, and there's not much question about what we have to do here. For the sake of the environment, the economy, our own national soul and self-respect, and the fate of the rest of the world, there is just one intractable, inevitable answer. We need to get off foreign oil, starting five years ago. Or, at least: while we've still got enough of our own left in the ground to strategically manage a reasonable and sane transition, because this ain't gonna happen overnight. The Bush Administration was put into place by the oil industry for the purpose of forestalling this transition as long as possible -- even if it cost the country everything. (And, as it turned out, it did.) We cannot afford to install another administration that isn't fully committed to turning us around 180 degrees, and setting us decisively and smartly on the path toward a future without oil. Let's not kid ourselves. This is going to be a devastating change, requiring the complete re-structuring of the planet's whole economy. Entire countries will rise and fall -- some peacefully declining, others shattered in resource wars. Vast industries will vanish, and others emerge in their place -- displacing vast fortunes and power centers, and creating new elites in unforeseen places. New solutions will create new problems that we can't possibly predict now, but we will have to deal with as part of the change. It's what happened when we moved from horses and water to coal; and again when we moved from coal to oil. From that history, we know that we're probably in for a rough century. The nanotech and biotech guys tell us not to sweat it; in no time flat, we'll have bacteria breeding oil for us, and nanobots scrubbing the carbon emissions from the skies. It could happen, absolutely. I hope it does. But I'm not yet ready to bet my children's lives, and the fate of the planet, on the hope of things not yet seen. In the meantime, we need to understand where we are, and do the right thing with the facts and technology we have. That feeling of free-fall we're all having when we look at our politics, our economy, our global standing, our gas bills, and our future -- it's all because we've got these big barrels of oil tied to our waists, pulling us with gathering speed down the hard side of Hubbert's Curve toward a fast-approaching hard landing. If we want to break the fall, we have to break our dependence on oil.